The business end of the 2018 Men's Hockey World Cup carried on as the third quarter final of the competition saw two European heavyweights clash as Germany took to the turf against the Belgium side. 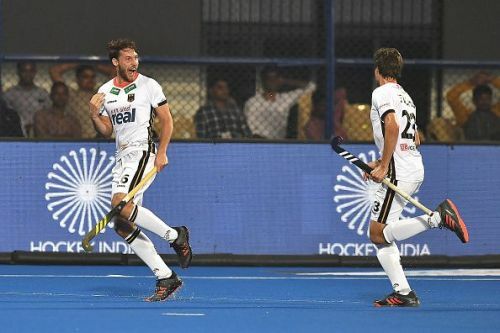 Germany entered the quarterfinals after topping the Pool D consisting of fellow European rivals Netherlands and Asian counterparts Pakistan and Malaysia. The Germans beat all the sides in the group which was deemed to be the 'Group of Death' at the 2018 Men's Hockey World Cup. Belgium, pooled along with the hosts India, Canada and South Africa reached the quarter final through the crossover route after finishing second behind India in the Pool C after having the inferior goal difference as compared to India. They faced four-time champions Pakistan in their crossover fixture and thrashed the Asian side 5-0 to set up the clash against Germany. The Germans began the match on a strong note attacking in full force and kept the Belgian defensive wall on their toes in the initial minutes of the match. Germany was rewarded for their persistence towards the end of the first quarter when a quick move on the right wing placed Dieter Linnekogel free inside the circle with an open shot at the goal. He was on target with his hit scoring past the Vincent Vanasch in the Belgian goal to make it 1-0. 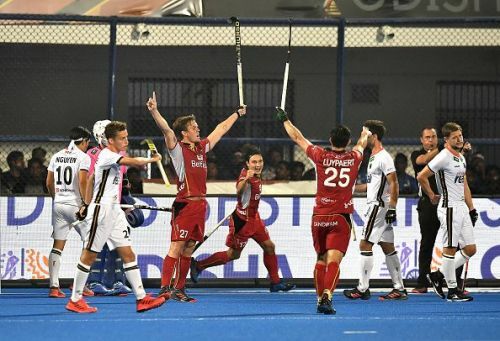 The Belgians hit back just three minutes later in the second quarter as Alexander Hendrickx slotted in his fifth penalty corner attempt to beat the resilient Tobias Walter in the German goal. A 50th minute goal from star striker Tom Boon was the decider on the evening as the Belgians resisted the German attacks and reached their first ever semifinal of the Men's World Cup. They will take on England in the first semifinal of the competition on 15th December 2018. The German side started off on a strong note dominating the play in the early exchanges of the match. They utilised their wingers well making good moves into the final circle of the Belgian defence and had them troubled for a while. They got their goal when a smart cross from the right wing reached Dieter Linnekogel with a clear shot at the goal from roughly the penalty stroke spot. Linnekogel was on target and gave the German side the lead towards the end of the first quarter. However, things were up for a change as Belgium earned a flurry of penalty corners that were kept away by the German keeper Tobias Walter as the first quarter ended 1-0 in favour of the Germans.